lizabeth Lademan began lessons on the violin at the age of eight, and studied primarily under Paul Windt, a student of Jascha Brodsky. At thirteen, she entered junior youth orchestra, and a year later wrote her first orchestral composition which was performed for two of the tri-annual school-tour series and at the following spring concert. She graduated to the Young Peoples' Philharmonic when she was fifteen, and in one year progressed to first chair where she led as concert mistress for two years. At this time she began to study viola as a second instrument. 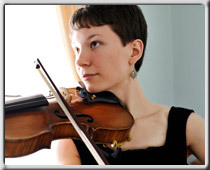 In 2002, she won a scholarship to attend the six-week summer program at Kinhaven Music School in Weston, VT on both instruments. In the fall of 2004, Elizabeth entered Thomas Aquinas College for Liberal Arts in Santa Paula, CA. She joined the student orchestra and continued to play with them on viola all four years. She also played in numerous chamber ensembles for the many recitals offered at the college. She graduated in 2008 with a Bachelor's Degree in Liberal Arts. It was during her senior year, after working on a project involving drawing portraits of her classmates, that Elizabeth decided to start a business in portraiture as soon as she was able. After graduating, Elizabeth returned to Charles Town, WV to live with her family, where she established her portraiture business. At the same time, she became involved in the music program at St. James’ the Greater Roman Catholic Church, and in December of 2008 participated in the Musica San Giacomo pilgrimage to Italy where she sang with the Cappella Magna and performed on the violin. She was named the first Artist in Residence at Saint James Church, and performed at Masses on violin, viola, octave viola and lever harp. In 2010, she wrote her first choral piece O Send Forth Thy Light, which was chosen by the Diocese of Wheeling-Charleston to be sung at the Rite of Election in March of 2011. Elizabeth's music and art may be found at www.ivorystudioportraiture.com.